The hand up rescue/recovery has more recently been named the "Hand of God" (HOG) rescue. Remember our definition of recovery vs. rescue? (see USK library page "Capsize Recoveries") By sticking with our definitions, the HOG will most likely be used when a paddler is stuck in their kayak or has gone unconscious. This would put it in the category of a rescue, because you only have a couple of minutes to get the paddler's head above water. 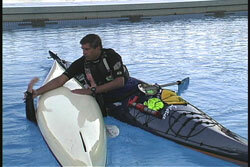 If you use the HOG as an alternative to the Eskimo Bow Recovery or the Eskimo Paddle Recovery (See USK articles "Eskimo Bow Recovery" and "Eskimo Paddle Recovery") it may not be an immediate emergency, because the capsized paddler is assumed conscious and in control since they are waving their arms. If you do not get to them in time they still have alternatives as compared to being unconscious. The reality is, regardless of how we categorize the technique; we have to get to the overturned paddler to assist them as quickly as possible. When this skill is done correctly it looks very smooth and easy. This can be deceptive, because if there are very large weight differences between the two paddlers involved in the rescue, then this skill may not work. This can also be an equipment specific skill depending on the shape of the two kayaks. Not everyone can right all kayaks, so you need to practice with as many different kayaks and different size paddlers to make this skill more reliable. 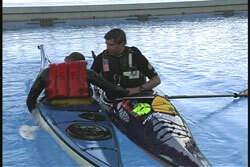 The HOG rescue is also a base technique for the Scoop Rescue (See USK article, "Scoop Recovery").The ultimate goal of this skill is to right the overturned paddler, while they are still in their cockpit, in order to get their head above water and find out if they are still breathing. The upright kayaker is the one who does all of the work. The HOG name was given to this method, because if you were upside down in your kayak the person coming from above to haul you up is like the Hand of God coming down to save you. The key element of this rescue is to commit your weight to the overturned kayak. You will not capsize. Reach over the overturned hull to grab the far hand of the inverted paddler if they were conscious and had a hand up. If they did not have their hand up, then you will have to reach over and grab the edge of the kayak farthest away from your kayak. If you can grab their cockpit coaming you will have a better grip. As I pull up on the outside edge I also like to push down on the edge of the kayak's hull (closest to me) as I try to roll the paddler upright. Do not think of this as lifting the victim up. Focus your enery to rolling the kayak. After you get the hand/arm/cockpit coaming of the paddler in need, continue to roll the kayak upright. Don't hesitate to use whatever means possible after you begin rolling the victim up. Grabbing clothing is fair game when trying to get your partner out from under the water. There have been a few big paddlers that caused me to lean way back away from their kayak in order to get enough leverage to right the kayaker. Some rescuers try to keep the unconscious paddler's body leaned toward the rear deck, to lower the center of gravity, which makes rolling the kayak upright easier. Again, you are trying to roll the kayak. If you just pull up on the outside edge, you will be pulling the overturned kayak toward you and against your kayak. If the capsized kayak has a hard chine the rolling motion can be inhibited. That is why I also push down on the hull. It may be necessary to push the kayak away from you as you roll it up. If there is a sticking point it usually occurs when the kayak is about 70% righted. This is a good time to push down on the edge that is closest to you. When you push down you can also push the edge away from you so it doesn't get pinned against your kayak. When the paddler is upright you then need to worry about continuous support to keep them upright. If they were unconscious, then they would fall over the moment you let go. If they were unconscious you would immediately need to see if they are breathing. Apply whatever CPR/first aid techniques you can do effectively while in kayaks. The next challenge you will have is trying to get this unconscious paddler back to shore. If you were alone it may be possible if you have a set of the sea-wings (See USK article "Sea Wings Recoveries & Uses"). Otherwise you would have to call for assistance. Remember to keep those radios and cell phone charged on the trip and in their appropriate dry bags. If there is more than one rescuer, then a supportive tow could be used. Since I preach utilizing the group whenever possible, I recommend you practice this skill with two or three rescuers available. This way you can see how others can best help. The goal is to try to get the capsized paddler upright without any rescuer capsizing or getting out of their kayak. Utilizing the support of the other kayaks near you &/or paddle bridges are a key for staying upright. Even grabbing the PFD of the main rescuer and pulling (to help give them leverage) can make the difference. Larger victims may necessitate getting a second rescuer to the outside and lifting the victim the last bit of the way. Practicing the orchestration of movement is very important before you need the skill. Again, time is very important for this rescue. If you are a guide or an instructor this is a must have skill. When any student is doing their first wet exit while away from shore, I am right next to them ready to roll them back up if there was any sign of difficulty. I suggest you get out and practice this skill on all different size paddlers in different types of kayaks. Get good at saving the Big Guy. Who knows, one day you might be saving me and I am very big.